1 Paro - Phuntsholing - Jaldhapara At the morning drive to Phuntsholing. Lunch we will take on the way. Depending on the time, we can visit Phutnsholing gompa with great view of the town and then disembark from Bhutan and do all necessary immigration formalities in India. Jaldhapara is about 1 hour from the border. Accommodation in hotel. 2 Jaldhapara - Kalimpong Jaldhapara is one of the best national parks in West Bengal. Here you can see wild buffaloes, elephants, peacocks and most importantly one horned Indian rhino. The best chance to see this elusive animal is on the back of elephant early in the morning. Even if you're not lucky to see the animal, the elephant ride through the dense jungle is worthy experience. After breakfast you'll drive to Kalimpong. 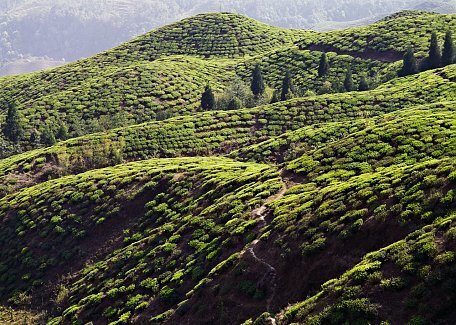 The road goes through the tea gardens until it starts ascending to hills through the Teesta river. In Kalimpong you will visit busy bazaar, interesting catholic church of Mother Therese where Jesus is depicted as Tibetan Dalailama and monastery on the hill top above the town where spectacular prayer is held each evening. Overnight in hotel. 3 Kalimpong - Gangtok Early morning drive to Sikkim's capital Gangtok. After lunch in town visit to Namgyel institute of Tibetology with interesting dipslay. Do-drul chorten stupa nearby. Cable car view ride. Evening exploration of posh Mahatma Gandhi Road in city centre. Overnight in hotel. 4 Gangtok, excursion to Phodong monastery We will drive north of Gagntok by scenic road with brief stop on Tashi viewpoint, Seven Sisters waterfall and possibly other places. After about 2 hour drive you reach to Phodong monastery. Here you can make enjoyable stroll and visit the beautifully decorated temple. Drive back to Gangtok. Visit to former royal temple and peek at the former Sikkim ruler residence. 5 Gangtok - Darjeeling Drive over the valley to Rumtek monastery, the headquarters of Karma kagyu order of Tibetan Buddhism. Later nice hike through paddy fields and continue in drive to Darjeeling. Reaching the destination at the evening. 6 Darjeeling Walk to Chowrastha and walk to Observatory hill with Hindu-Buddhist temple on the top. Toy Train ride from Darjeeling to Ghoom.Then visit of Yiga Choling Gompa, small but beautifully painted Geluk monastary in Ghoom. Afternoon short hike through tea plantation down to the Happy Valley Tea Factory and factory visit. Finish sigtseeing with Himalayan Zoo and Mountaineering institute. 7 Darjeeling - Bagdogra, departure Early morning drive to Tiger Hill for sunrise with view of Kanchenjunga. Then drive to Bagdogra for onward flight to your final destination. Going opposite way: It's also possible to start tour in Bagdogra and continue via Darjeeling, Gangtok and Kalimpong to Jaldhapara and conclude tirp in Bhutan. Please contact us for itinerary. Dzongri / Kanchejunga base camp trek: You can extend this tour by beautiful 9 to 10 days Kanchejunga base camp trek. It's full camping trek but don't worry, we can arrange very professional and reliable staff to help you. This is very special rarely done trek with stunning views which will make you understand why Kanchejunga is considered holy mountain of Sikkim. Please keep up the excellent service. We are hoping to come back to Bhutan again, soon !